The Town of Benson’s relationship with ElectriCities is much more than power management. Together, the two organizations have worked on a wide range of projects that continue to flourish — from economic development to education. 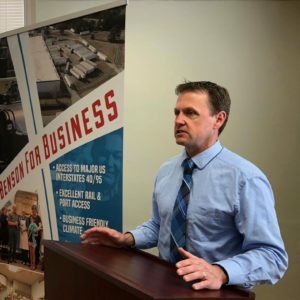 On Wednesday, Benson Town Manager Matt Zapp was re-elected to the ElectriCities Board of Directors, a position he has held for three years. Mr. Zapp remains in this role with several other public power administrators from Wilson, Kings Mountain, Gastonia, and Wake Forest, among others. ElectriCities has 92 public power communities in North Carolina, South Carolina, and Virginia. This program is designed to assist emerging youth in their efforts to prepare for a career as an electric lineworker. In a nutshell, high school seniors attend Saturday classes during the school year. Following passage, they enter a 360-hour paid internship with a public power community (Benson among them) and eventually earn a full-ride through a lineworkers program at one of five community colleges in North Carolina. “This program allows students to begin working right after graduation,” explained Mr. Zapp. For its inaugural class, the Lineworker Pre-Apprentice Program saw more than a dozen area high school seniors attend. In addition to the lineworker program, Mr. Zapp also works closely with the Raleigh-based Research Triangle Cleantech Cluster (RTCC). The RTCC is just that — a “cluster” of business, government, academic, and nonprofit leaders focused on accelerating innovation in local communities through the use of cutting-edge “clean” technology — everything from new forms of farming to fully automated electric vehicles. Mr. Zapp will continue this technological push for Benson early next year, when he chairs the ElectriCities Connections Summit held in Raleigh in February.